Starring Tenzin Thuthob Tsarong, Gyurme Tethong, Tulku Jamyang Kunga Tenzin, Tenzin Yeshi Paichang, Tencho Gyalpo, Tsewang Migyur Khangsar, Geshi Yeshi Gyatso, Sonam Phuntsok, Lobsang Samten, Gyatso Lukhang, Tsewang Jigme Tsarong & Robert Lin. 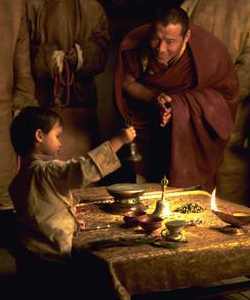 "Kundun" is more a sensory experience than strictly linear story telling. The peace that is the center of the Buddhism rings throughout the picture and a mysterious, magical air of something larger in scope than just the tale at hand permeates every scene. An entirely different kind of Martin Scorsese movie (i.e. neither violent or largely concerned with the crime), this is a biography of the 14th Dalai Lama, the current head of the Buddhist religion and leader of the Tibetan government-in-exile. His story is one of faith, strength and perseverance, and like "Gandhi," it is the kind of modern historical drama that, when brought to the screen for the masses, had better be done right or it would be an embarrassment. In making this film, Scorsese's instincts were faultless. From the location scouting and photography (Morocco's high desert mountains, standing in for Tibet, are arid but picturesque) to calmly astute demeanor of the four actors playing the Dalai Lama at ages 2, 5, 12 and 18 -- everything is perfectly in place. The Dalai Lama is believed by Buddhists to be the perpetually reincarnated spirit of Buddha of Compassion, and when a Dalai Lama dies, high ranking monks quietly fan out over Tibet to search for the child born soon thereafter who carries that spirit. The film opens in 1939 when the current Dalai Lama was 2 years old. In a scene bubbling with mysticism, a monk who has found this child he believes to be the reincarnated Holiness lays out a table in the child's home with some of the last Dalai Lama's belongings and many decoys. The playful and precocious boy examines the table and begins snatching items that belonged to number 13 -- a bell, eye glasses, a walking stick -- insisting, politely "This is mine," as he picks up each one. Identified as the reincarnation, he and his family are whisked away to a monistary in Lhasa, the Tibetan holy city, and we next see him at age 5 participating in various rituals as the monks train him to be their leader. In one scene he plays a war game with his mentor. "I have stronger men," the boy says proudly. "I have smarter men," his teacher answers back. It is scenes like this, which subtly invoke simple truths, that give "Kundun" its appealingly insightful but enigmatic atmosphere. The film becomes more gripping as it movies into the 1940s, when the Dalai Lama grows up and Communist China begins to threaten an invasion of Tibet. His Holiness, as he is addressed, begins to exercise all he has learned and to recognize his inherited wisdom. But it isn't much use against the Chinese, who overrun the country with a ruthless, marauding army and force him to flee. Scorsese's use of symbolism rather than war footage is potent as he shares the Dalai Lama's horrible metaphysical visions, as he did with Jesus in "The Last Temptation of Christ." Occasionally ripping through the usually tranquil framework are disturbing flashes of children being forced to murder their parents, dreams of blood invading colorful fish in a very blue pond and an unforgettable shot of the Dalai Lama standing in the center of a courtyard littered (somehow aestheticly) with hundreds of slaughtered monks. However, one of the most effective scenes is not a vision, but the recreation of a meeting between the Dalai Lama and Chinese leader Mao Tse-Tung in which Mao proclaims abruptly that "Religion is poisssson," with such a menacing hiss that the sound runs down your spine. The script, written by Martha Mathison ("E.T. "), was based on several interviews she conducted with the Dalai Lama, and it rings with authenticity. Few of the players in the film are experienced actors (that's why I haven't identified them by name), so the fact that every performance is deeply felt also lends the movie a special credence. But the powerful impression "Kundun" leaves is owed primarily to Scorsese's meticulous orchestration and the stunning art direction by production and costume designer Dante Ferretti ("Hamlet," "Interview with the Vampire"). The film is a bit pokey at times, which is really my only complaint -- and the reason I've given it three stars instead of four. I also gave three stars to "Seven Years in Tibet," the Brad Pitt vehicle of a couple months back which also concerned the Dalai Lama, because it was a movie I would recommend. But I want to state clearly that this is a vastly superior film. For a commanding drama about the tribulations of Tibet through the eyes of her benevolent leader, "Kundun" is the way to go.